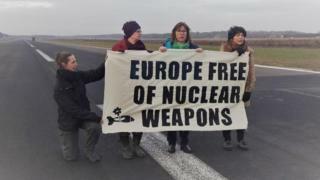 Three MEPs have been arrested during a protest against nuclear weapons at an air base in Belgium, the Green Party has confirmed. Among them is South West MEP Molly Scott Cato, from Bristol. The group included a number of Belgian peace activists who scaled the wall of the Kleine Brogel base in the east of the country and blocked the runway. The MEPs are currently being held in a local police station and questioned. Ms Scott Cato said they were protesting against the stockpiling of American nuclear bombs. She tweeted: "Weapons that could kill millions of people puts one's own personal safety into perspective."